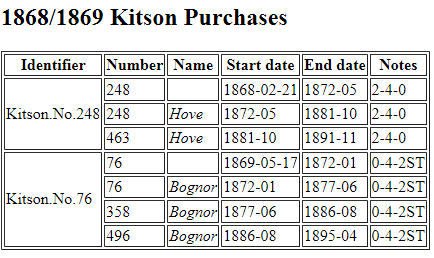 No 76 ‘Bodmin’ was a single purchase from Kitson, in 1869, for use on the Bognor branch. It was the only member of this locomotive class. Re-numbered twice and finally carrying No 496 when used on the Hayling branch line, to replace the two two Sharp Stewart locomotives (Nos 497 Fratton & 499 Hayling Island) which were withdrawn in 1889/90. It’s time on the branch was very short because the first Stroudley terriers became available and some were transferred to Fratton in 1890, for use on the Hayling branch line. 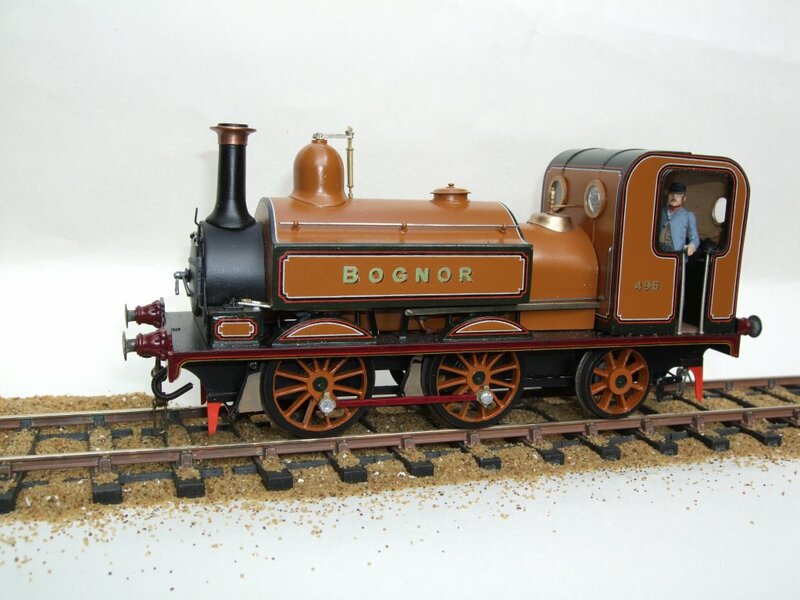 Bognor was transferred to Eastbourne in Dec 1891 and scrapped in 1894. Photographs of this locomotive are elusive. If you have access to any, please submit them for inclusion on the website. The superb model below, is the only profile image available. 0-4-2ST. This is a general type description for a steam locomotive. The digits describe the wheel arrangement. In this case, 0 pilot wheels, 4 driving wheels and 2 trailing wheels. The coal and water have to be carried on the locomotive if no tender is attached. This is where the suffix comes in. Water is contained in Tank(s) around the boiler, a water tank that wraps over the boiler is called a saddle tank and the suffix ‘S‘ is used. if a tender is not provided then the loco type is a Tank engine and the suffix ‘T‘ is used.